​suspend gas hoses and cables on this convenient equipment. ■ Front supporter : moves right/left and up/down. Hydraulic pump installed on the wall operates the up/down movement of front supporter. Right/left movement is manually operated by workers. ■ Turning supporter : moves right/left manually by workers. ■ Installing plate for wire feeder : The part for wire feeder’s installation. ■ Extended length : Front supporter moves up/down within 70˚. 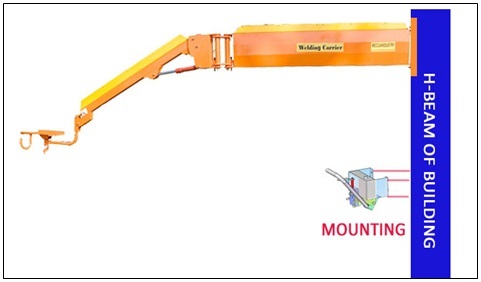 ■ Installing spot of whole body to the wall : To the wall or standing H-beam, Welding Carrier is available to be installed on the height that users want to mount. ■ Tip hook : Welding tip can be hung on feeder hook. ​■ Cable hook : Cables of welding feeder can be hung on cable hook. 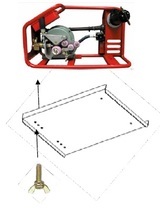 ■ Manual hydraulic pump : With it, users can operated Welding Carrier left/right and up/down movements. 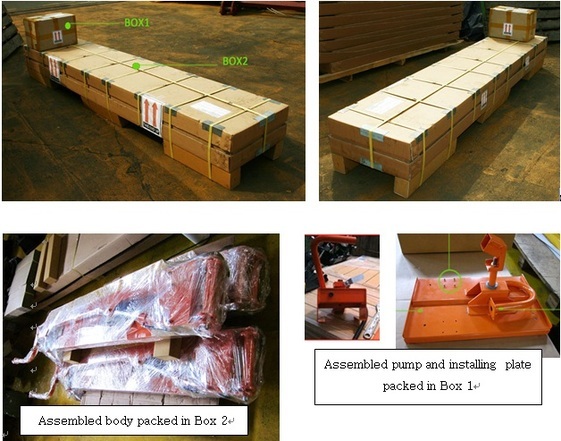 In two boxes, Welding Carrier is shipped to you. 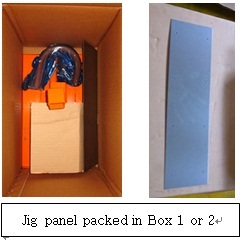 ※ Jig panel which is needed when finding and making exact holes for attaching Welding Carrier to the pillar is packed in Box1 or Box2. Use your pillars in the workshop. ※ Any information relates to structural calculation when installing Welding Carrier to the wall or H-beam of workshop would not be offered to customers. Installers ought to inquire of professional office about structural calculation. All responsibilities relates to structural calculation is on installers. 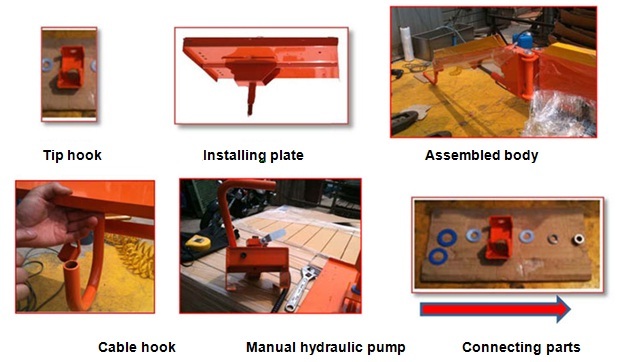 With the bolts screwed on purchased welding feeder, users can install the welding feeder on installing plate easily.